Nvidia has announced a new platform for netbooks , that is designed to deliver high end graphics similar to that of a PC, with their new Nvidia Ion Platform. The Nvidia Ion Platform will be able to deliver HD video and high end 3D gaming to your netbook, the platform combines Intel’s Atom processor with a Nvidia GeForce 9400m GPU, and it is likely to be released in the first half of 2009. 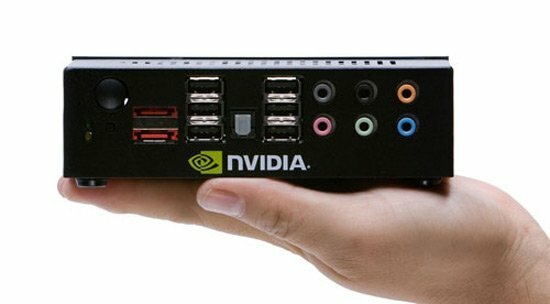 The new Nvidia Ion platform will powerful enough to run Windows Vista and Windows 7 on netbooks, and according to Nvidia this new platform will generate less heat than the current Atom system, whilst offering the same battery life. This new platform is likely to only add an extra $50 to netbook prices, and if it delivers the graphics performance Nvidia are claiming, we could see it in the majority of netbooks by the end of next year. The first picture shown is of the new Ion Reference, which is a small desktop PC like the Dell Optiplex 160.